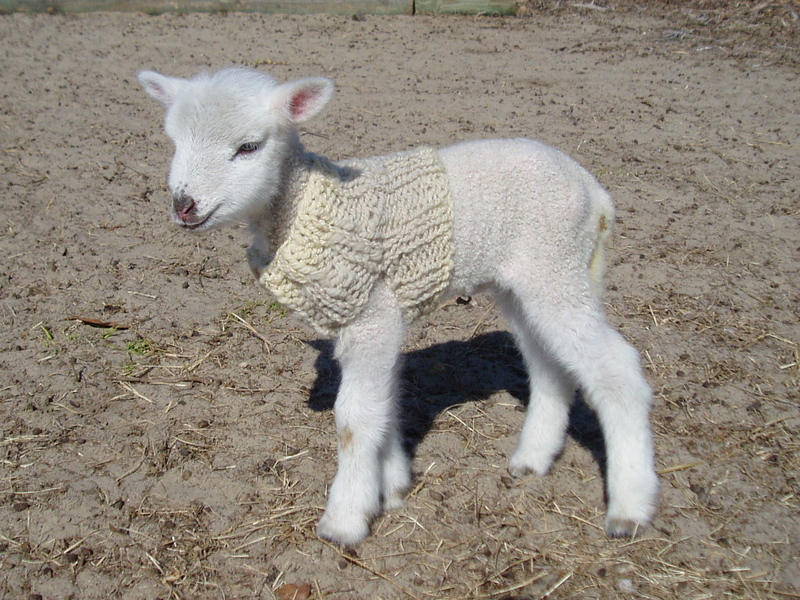 Wouldn’t you know I would run out of yarn when I got to the armholes? Ha! Oh, I knew there wasn’t enough, it’s just I’d finally gotten back into the rhythm of cabling. Knit & Purl & a Prong to the Back & Knit & Knit from the Back & a Prong to the Front & Knit & Knit from the Front & Purl & Knit & on & on & on & on. So, I was sort of bummed when I had to card card card and spin spin spin to match the worsted weight springy Sally yarn. Button Button who’s got the Button? Alright, I know. Be careful what you wish for…or for what you wish. I wished for sweater weather, rather than sweatful weather. And, I got it! Today, Oatmeal Cardi was given the chance to go to work, do its job, you know, be worn. But, I still hadn’t figured out the buttons. So, Tom gave me some slices of wood, cherry, mahogany, and maple, and said, “Go to town.” I did. I messed around for awhile, carving ovals, curvy rectangles, and all manner of awful things. Finally, I settled on some scooped corner mahogany squares, edges broken just enough to be smooth, and big enough to stay buttoned. That’s them. Up there in the picture. Still unfinished, but tomorrow’s another day. They’ll be a dark red, lovely mahogany. 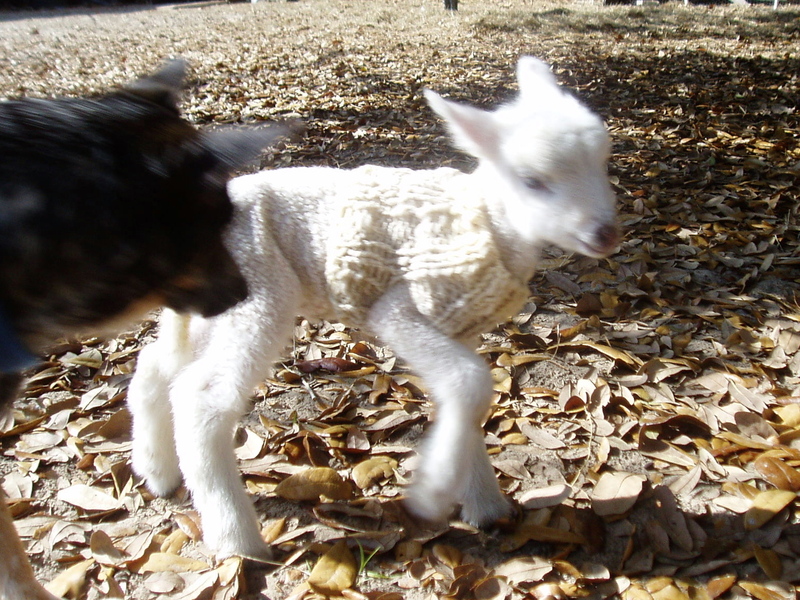 Well, so far, none of the darn photos show the red alpaca in the knit. I think that when the buttons are finish coated, and their color is vibrant, the red in the yarn will pop. A little bit. I hope. This is a recipe on which to found an empire. What’s in these muffins? 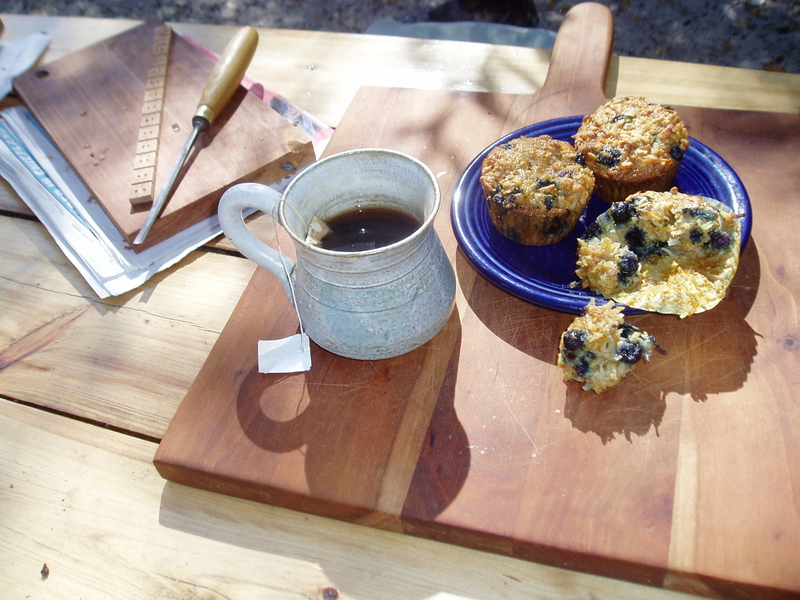 Coconut, oats, tangerine, blueberries, the neighbors’ honey. And this and that, the stuff that unforgettableizes them. Time to give ba-bas to the babies. Good thing I took this picture when I did. 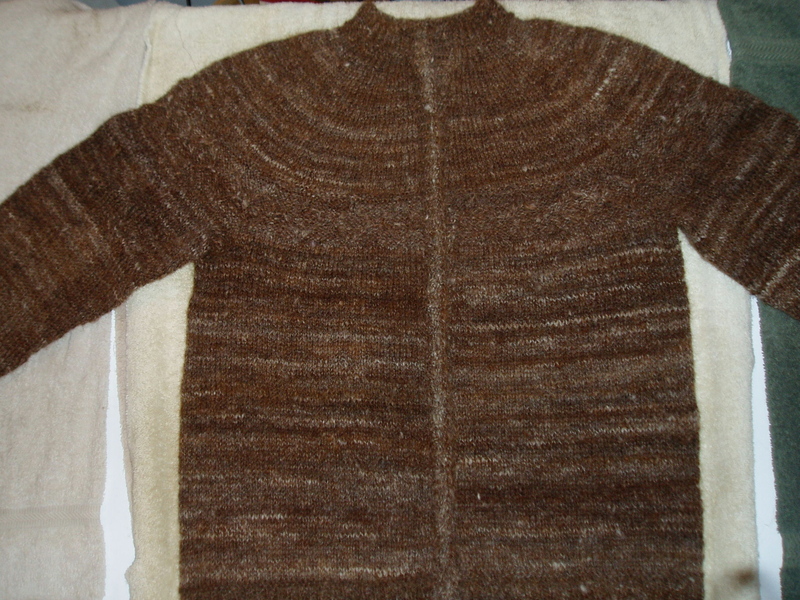 The sweater’s still wet, and I readjusted the yoke. But, hey. Here’s the thing. 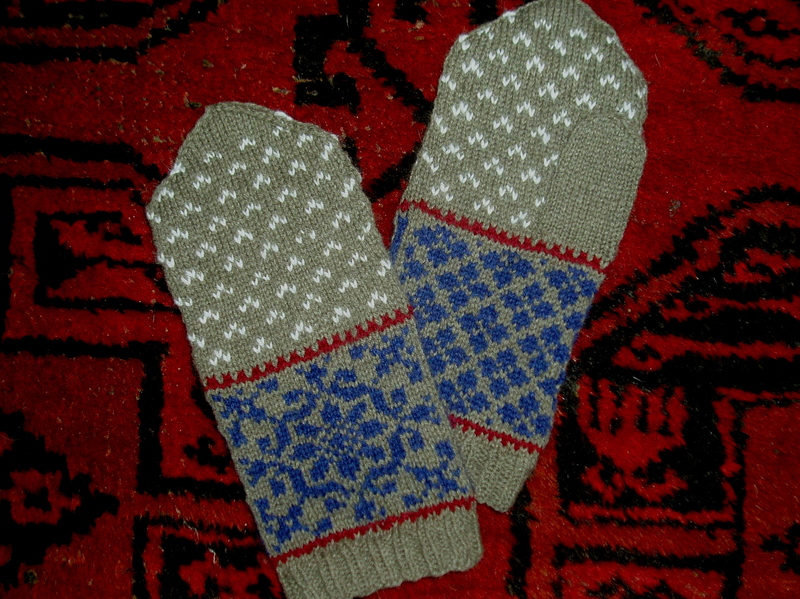 The knitting is done! Tom’s making me some cherry buttons…in his spare time (right). Thank you Amy King for a great pattern! So…it’s on to the next project…which is the finishing up of the Eco-Vest (Katie Himmelberg). Mary Hogan – 5 months old Today! Well, on the 10th of February, around 2 in the morning, Annie Hogan was born. 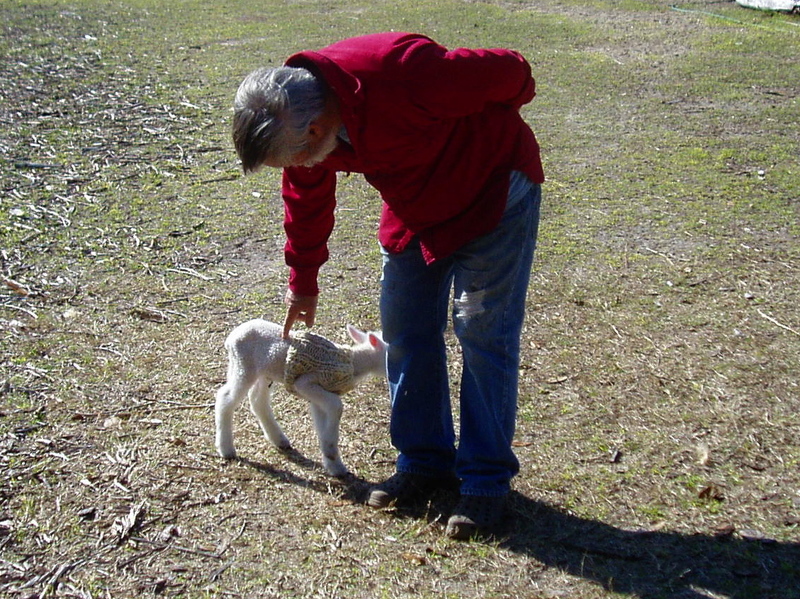 She was the first of twin Gulf Coast Native ewe lambs born to Sally. Rosie came next, smaller, more fragile. Sally decided to keep Rosie. 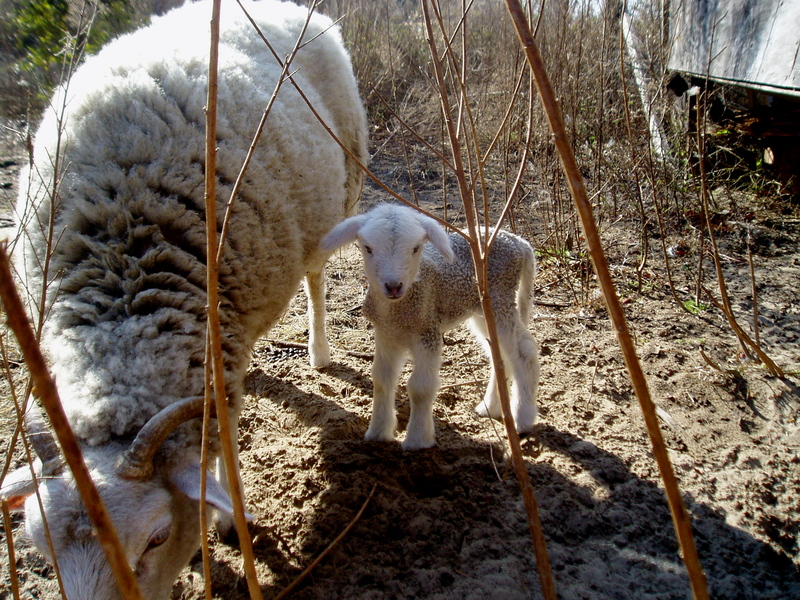 She left Annie under the barn, and when Maa retrieved her, Sally let us know that she was a one-baby Mama. 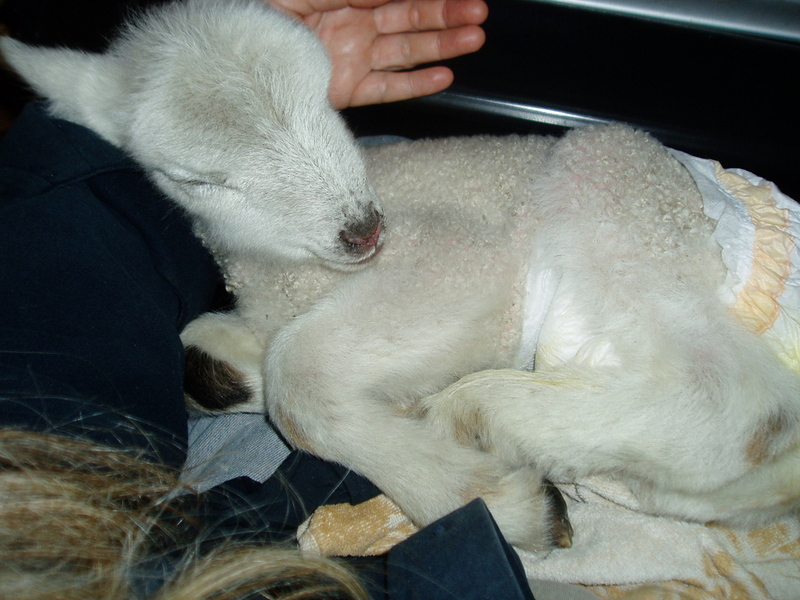 So, we brought Annie in the house, fed her colostrum, popped her on a towel on the lap o’ Pa, and went to sleep. For a very short while. 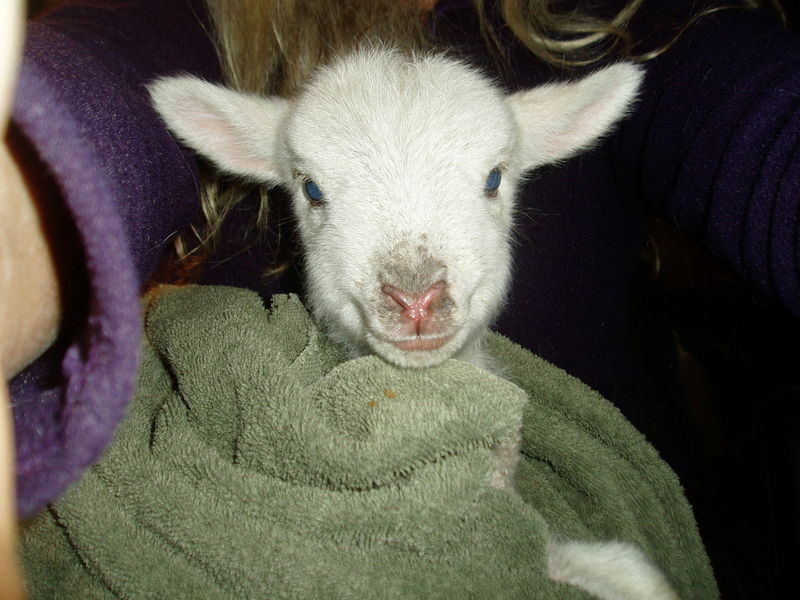 It’s been awhile since Sally rejected a lamb…Curly Lumpkin was the first…so we were a little out of practice. Yesterday was divided between setting up a nice safe pen for Annie – in the living room, and picking up those necessities such as diapers and sheep milk replacer. Annie popcorned the entire way. Around and around the yard. Meeting chickens – yes, the hennys all came over to inspect her – and roosters and trees and leaves…so many interesting things to sniff! She posed for pictures, paid an uneventful visit to Sally and Rosie, and ran into Cousin Mary and Aunt Holly (who reminded us gently that she already has a child and doesn’t need another). Curly and Bing ran up from the big pasture and met us at the fence. Curly and Annie did a lot of kissy face stuff, but Bing, although courteous, really had better things to do than socialize with his 2-day old sister. A nice outing, all in all. When we came inside, Annie polished off the remains of her afternoon ba-ba, allowed me to shrug off her sweater and put on a fresh ditey, and then she marched into her crate and plopped down for a nice nap. Fashion detail: Annie’s sweater was knit from yarn spun from her momma Sally’s and Aunt Holly’s fleeces. I love oatmeal. We eat oatmeal and apples every single morning. 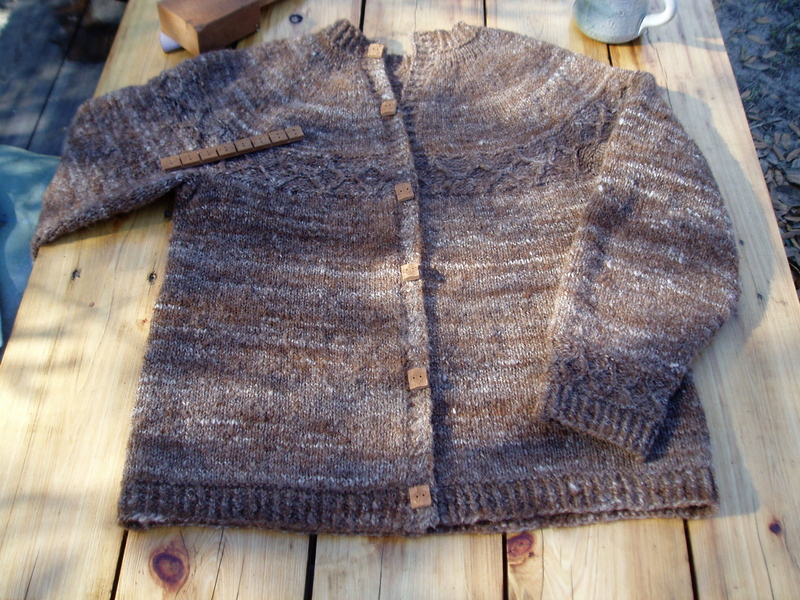 When I saw Amy King’s Oatmeal Cardigan in Spin-off (Winter 2009), I felt a tug. But, life when on. 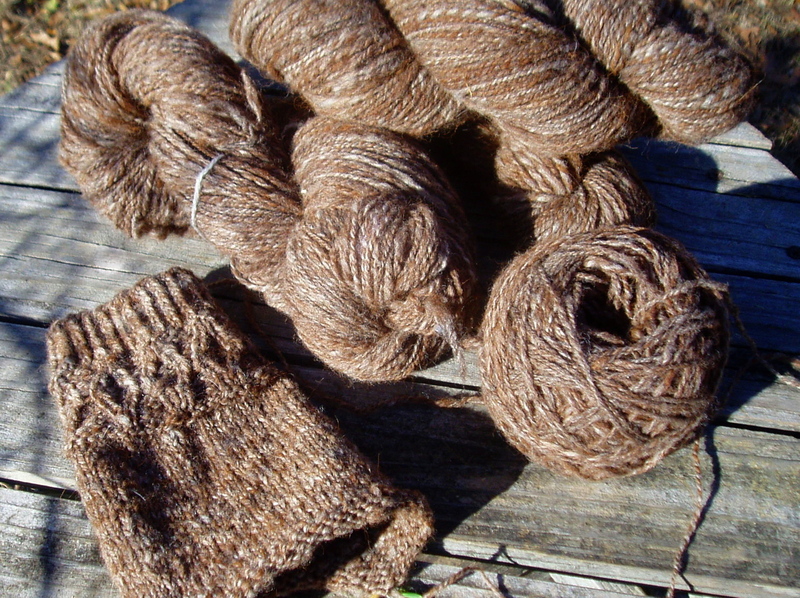 I spun a truckload of Gulf Coast Native/Alpaca blend for a Celtic Cape. Then I decided not to knit the cape. And I looked at that yarn, and looked at that yarn, and swatched for socks and sweaters and was so not-satisfied. Then, some cell in my brain wiggled, and I remembered the Oatmeal Cardi. I went through my samples, and there, in my hand, was ever the most perfect gauge swatch. So, I cast on. 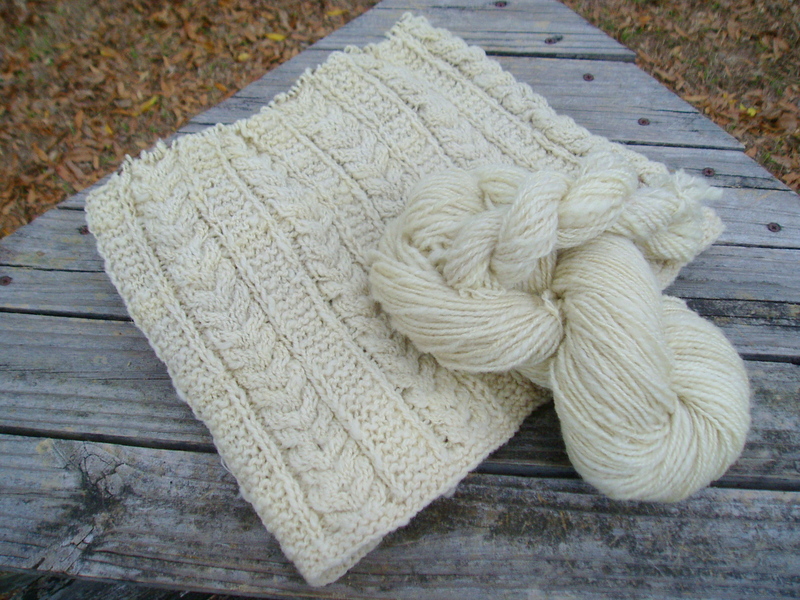 The yarn, supple, smooshy, and light, danced on and off the needles. Perfect perfect. 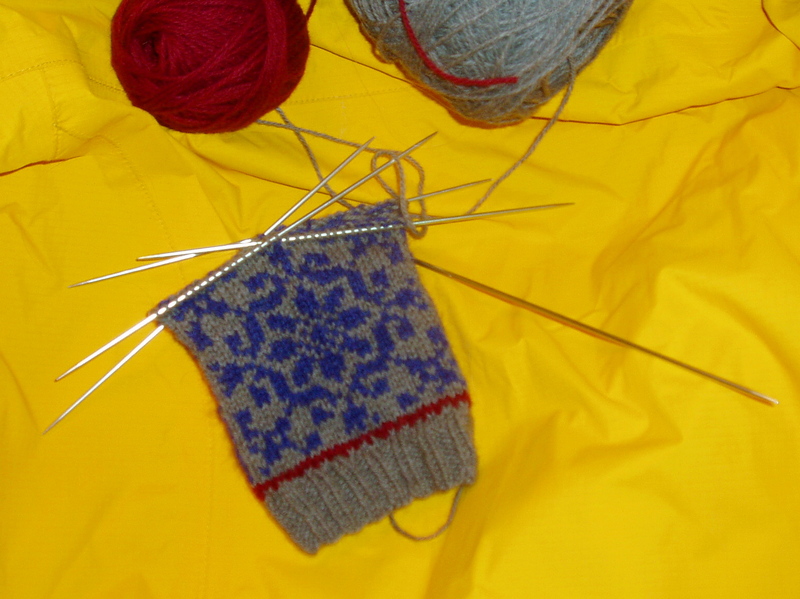 When I knit the charts for the pattern, though – what the? Yes, it was late. Three in the morning, I think. But, what was up with the charts? Next day, I reread them and reread them, and there was a big fat booboo. A couple cable symbols were reversed. So, I checked for errata on the Interweave site, and there, in front of my face, was the admission that the symbols had been reversed. You would think, after months of fiddling with that yarn, that I’d have been a more careful knitter, wouldn’t you? HA! I’ve been a writer for over 30 years, and I’m well aware of the crazy mistakes that can elude the most careful editor, and seemingly work their way into a completed document. But, I was so thrilled to have a pattern, an easy, mindless knit for a gorgeous gorgeous sweater…that I didn’t bother to look for mistakes. Fortunately, I was only 4 rows into the design, so tinking was not a huge deal. So…word to the wise, no matter what your pattern source, have the sense to check for errata. Now, let me get the chores done so I can sit down and knit! Okay okay. My needles are free again. Time to cast on another project. Hankering for a pair of thick boot socks to wear around here. Can’t find a size 4 circ or dpn in this house. I don’t understand. Gah! Gah gah gah! 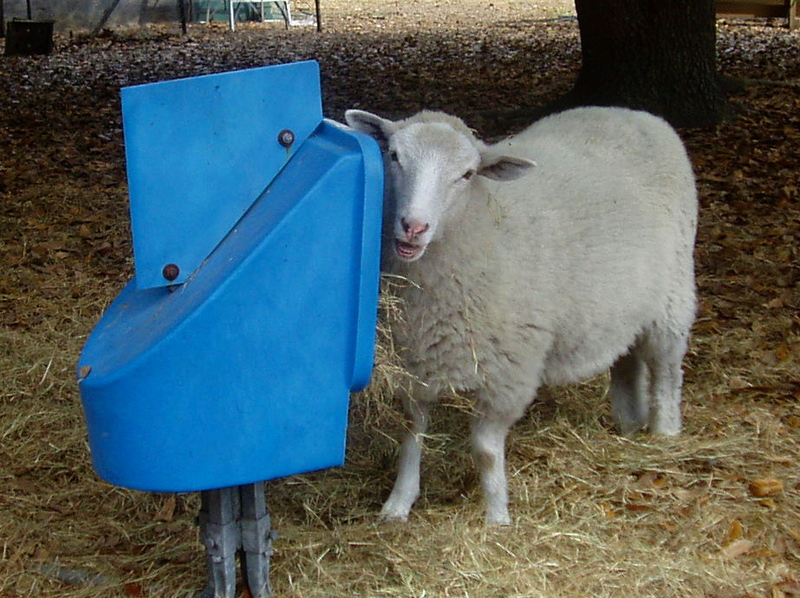 Well, after a solid week of intensive sheep care, I’m taking a day off – or rather, I’m giving Sam the Ram a day off. He’s holding his own. The sky has opened and we’re getting a good deal of much needed rain. I need to knit. And so, I’m knitting. Tell you what. I’ve never before knit a kit. But, I won this one, and by golly, I’m knitting ‘er up. This is a lovely pattern, lovely yarn, thanks to NaKniMitMo (a Ravelry group), designer SpillyJane, and Carol Sunday’s yarn. I like the pattern, am enjoying the knitting, but darn, I’m not all that excited about the colors. A good gray is hard to blend. I know about that. This gray is not a good gray. The red? Alright by itself, but beside the gray, something odd goes on in my brain. The blues, I like. I like the blues. But not against the gray. It’s the darn gray. All that crabbiness aside, this is a good day to knit. Even though I have a commission for a whole pile of laceweight, I need something brainless, something that doesn’t matter. Too many things matter too much sometimes, you know? Tomorrow is another day, baby.